Most bar charts have a continuous axis along the data, but only a discrete set of labels that correspond to each bar on the other axis. 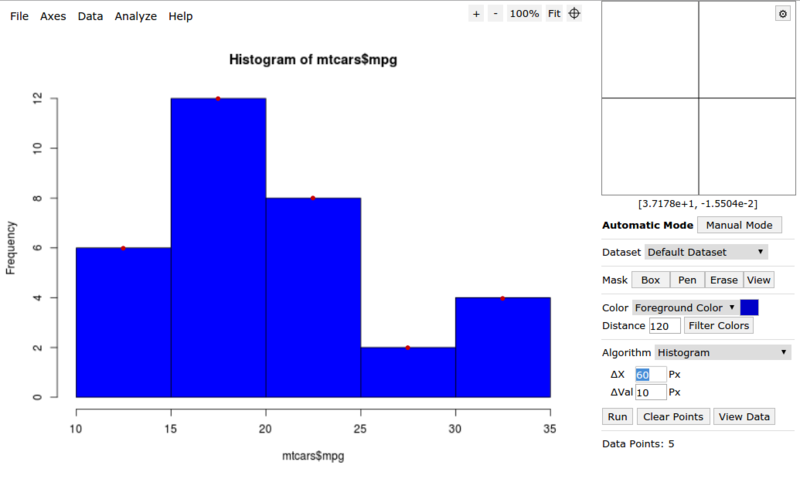 Keeping this in mind, a completely new plot type and an extraction algorithm has been added for bar charts. 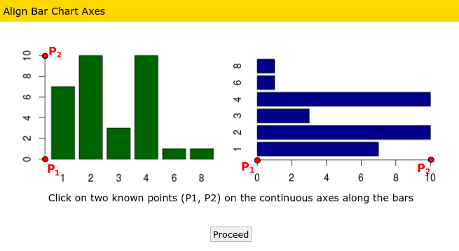 For the charts where both the axes are continuous (e.g. histograms), you can still use the 2D (X-Y) plot type, but a new algorithm is now available to help with bar charts. 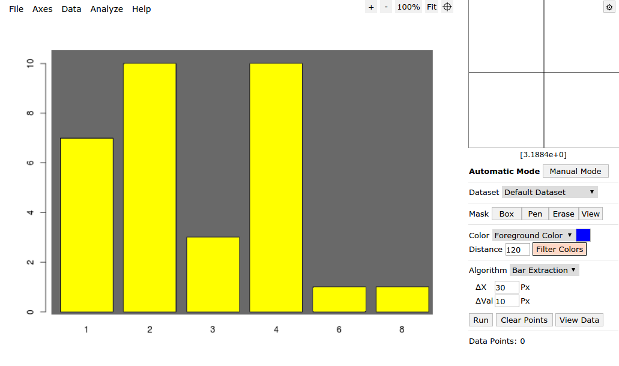 I will first describe the extraction process for simple bar charts followed by the process for histograms. 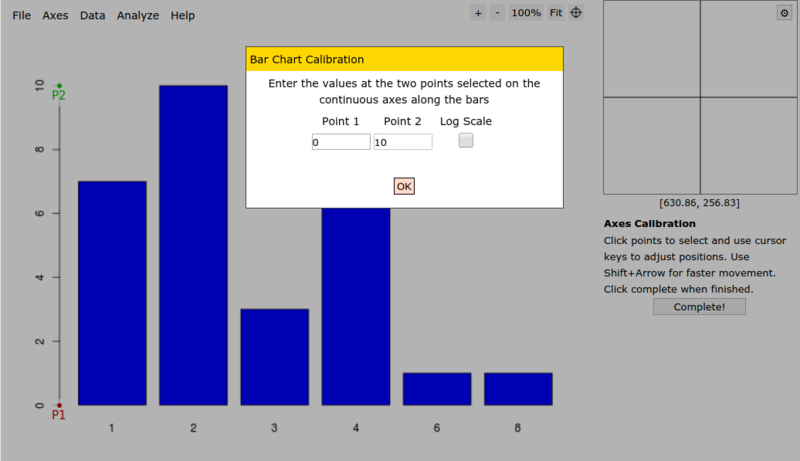 Just select the "2D Bar Plot" option after loading the image. You will be prompted to select two points on the axis that is along the bars. For horizontal bar charts, pick the two points on the X-axis. After picking two points on the axis, specify the values at those two points. 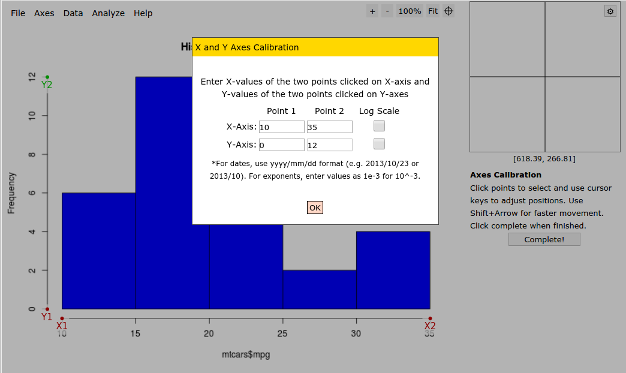 Select the "Log Scale" option if the data is in log-scale. The auto-extraction algorithm options are now context sensitive and so you will see only one extraction algorithm called "Bar Extraction". Adjust the two parameters (delta_X or delta_Y and delta_Val) until you see that only one point is detected per bar. With some images, the algorithm will not be able to make an accurate detection even upon adjustments and you might have to make small modifications in the manual mode later. 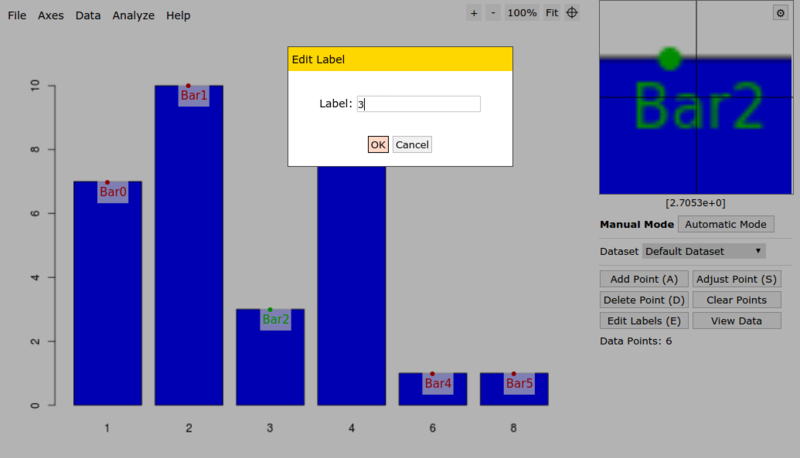 Once you have the data points, you might want to change the labels assigned to each data point (Bar0, Bar1, etc.). Just switch to manual mode and select the "Edit Labels" tool and click on the data point you wish to change the label for. This may get a little repetitive for a large number of data points, so you might want to do this later in your data analysis tool. Finally, just click "View Data" to view and export data points to a CSV file or Plotly. You can also export data to a JSON file from the File menu. While most bar charts can be digitized using the above method, it might be too tedious to work with bar charts where both axis are continuous and the "labels" for each bar is just a value on an axis. For these charts, you can just select 2D (X-Y) plot type at the start and calibrate the axis as you would for any other 2D X-Y plot in WebPlotDigitizer. The manual work should work just like it does for any other XY plot, but in the automatic mode, you will now have a new algorithm called "Histograms". This works almost exactly like the algorithm for bar charts above and you can simply adjust the two parameters until you get the desired results like you would in the above case. There are no labels for each data point to edit in this case. Finally, just click "View Data" to view or export the extracted data. 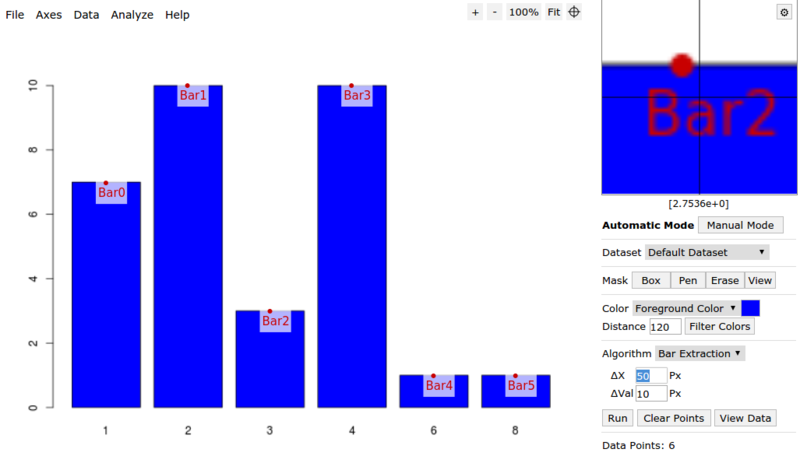 This is just a first implementation for bar charts and you can expect these features and algorithms to be refined over time. Suggestions for improvements are quite welcome! 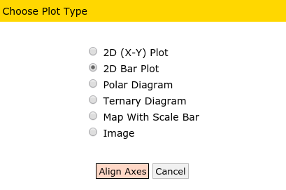 Calibration of plots other than 2D XY charts was affected in the recent Version 3.7 update. The build has now been fixed. Sorry about the inconvenience! I have also updated the downloadable version to the latest version 3.7 now. This version contains a number of minor fixes - especially for Polar Diagrams. Also, now the exported JSON file also contains the actual digitized data instead of just the pixel locations of the points. To read a summary of changes, check out the release notes. I have also been working on bar charts, grid removal and a Chrome Extension to allow opening any image on any webpage by simply right-clicking on it and selecting "Send to WebPlotDigitizer". Unfortunately, these features were not fully stable at the time of the release, so they have been disabled in this release.